The galago also referred to as the bush baby always encountered on Primate Safaris in Uganda appear as small night dwelling Species of Primates that is restricted to the continent of Africa. Regarding taxonomy, it belongs to the family Galagidae, Strepsirrhini Suborder, Lorisiformes Infraorder, Galago genus along with a wide range of Species including G. cameronensis, G. alleni, G. demidoff, G. gallarum, G. gabonensis, G. granti, G. moholi, G. matschiei, G. nyasae, G. rondoensis, G. orinus, G. senegalensis, G. zanzibaricus and G. thomasi. The Galago are given by the African Wildlife Foundation as the considerable successful primitive primate Species in the continent of Africa. The Galagos feature large eyes which provide them with good night vision, acute hearing, strong hind limbs and the long tails that enable them to gain balance as seen on Uganda safaris. The ears of the Galago are like those of bats and enable them to track insects during the night. The Galagos have the expertise of seizing the insects either on the ground or in the air as they are considerably fast and swift animals. While maneuvering through the thick bushes, the Galagos hold back their ears which are delicate to ensure their protection. The ears are also folded during the resting. The Galago feature nails on their digits except for the hind feet’s second toe which possesses a grooming claw. The Galago feature a gestation duration of 110 – 133 days and they produce young ones which have eyes that are half closed and unable to move by themselves at the start. However, following 6 – 8 days, the mother carries newly born in her mouth and places it on the tree branch as feeds. The female galago can produce triplets, twins and single and tend to be aggressive. The new born is kept in constant contact for the initial three (3) days with the mother. The mother feeds the young one for six (6) weeks and the young ones are able to feed themselves at 2 months period. The young galago feature rapid growth causing an awkward walk among the mother as she attempts to transport them. 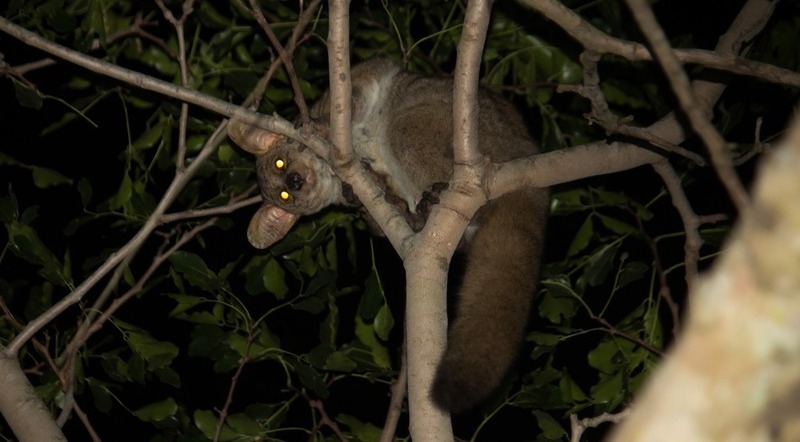 The Male Galago departs from the territories of their mothers after reaching puberty whereas the females stay to form social groups that comprise of females with close relations along with their young ones. The mature males keep distinct territories that overlap those of females. It can be noted that one mature male mates with all the area dwelling females. The galago males that have not attained such territories at times compose bachelor groups in small numbers. The Galagos undertake communication with one another by calling and using urine to mark their paths. By following the urine scent, they can land every time on the same branch. The group members at the end of the night use special rallying call and congregate to sleep in their nest comprised of group of branches, leaves and a tree hole. It can be noted that Galagos feature considerable ability to jump and the highest galago jump is 2.25m have remarkable jumping abilities. They tuck their legs and arms onto their body in the mid-flight and are brought out in the last second to grab the tree branch. In leap series, the galago can cover in mere seconds a distance of ten (10) yards. The Galago feature string muscles on their legs that facilitate their powerful jumps. The long tail also performs well to assist the powerful muscles of the legs to power the jumps. In Uganda, the galago is greatly found in the forest of Kibale National Park and Special nocturnal walk has been developed to enable the interested world travelers on Uganda safari to explore these nocturnal dwelling Primates.